The Navigators Piloting and Charting Reference Card puts the commonly used coastal navigation formulas and symbols on one handy card for easy reference. 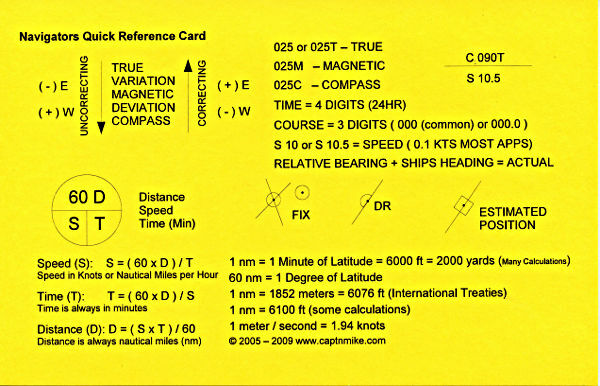 This card helps prevent mistakes when tired, or when doing your Navigation Class homework. Having the most commonly used formulas in one place for easy reference and not on scraps or paper that seem to get lost at the critical time, prevents a lot of stress and helps prevent mistakes from using the wrong formula because of being tired. The Time / Distance / Speed calculations are already worked out, but the good old “60 D Street” circle is also on the Navigators Piloting and Charting Reference. To use the “60 D Street” circle place a finger over the variable needed and the formula for that variable are the variables you can see arranged in the proper order. The Navigators Piloting and Charting Reference Cards make great gifts for those taking a navigation class and for boaters. Laminating them for use on a boat, helps keep them clean and prevents water damage. Surprise your favorite captain with one of these. The Navigators Piloting and Charting Reference started back before I joined the Coast Guard Auxiliary and took a half day intro to navigation class. There were several formulas in the book, I wrote them down on the back of a 5 x 8 index card and over the years added more bits of information to the card. 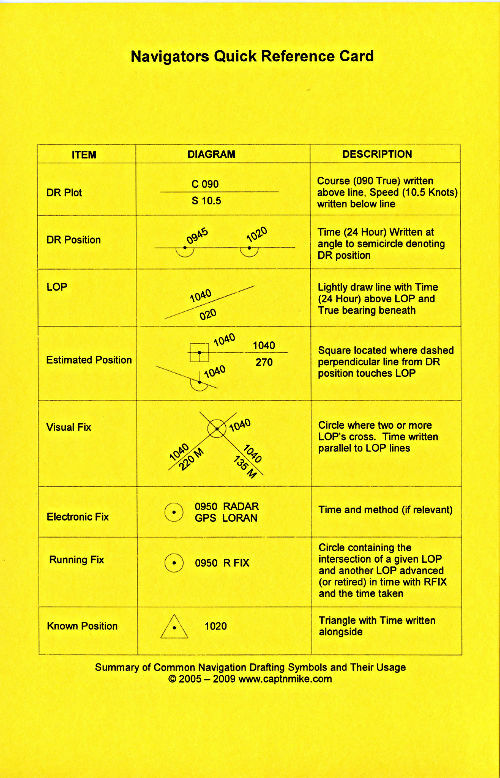 Some years later I wanted to put the Navigators Piloting and Charting Reference into a word processing program, at that time I added more information to the sheets, made it double-sided and six versions later you have this sheet. One of my instructors engraved the TVMDC formula in their Chart Table with a wood burning tool. This card saves the table top and the care has more information on it. Instructors can easily print the Navigators Piloting and Charting Reference on bright-colored standard weight letter paper, cut the sheets in half and hand the guide out to your students in a charting or navigation class. The format is two up on letter size paper and designed to print double-sided, either by using a duplex printer or running the sheets through the printer or copier twice. If you print on heavy cover stock, not all printers like to duplex heavy sheets. Printing Note: With some printers there is a difference between printing duplex and running the sheets through the printer twice. I have seen some differences in the alignment between the sides. Download the PDF for printing (66kb). UPDATED September 10, 2014: Added a slightly narrower version for those wanting to laminate the cards. The narrow cards have trim marks, trimming the cards allow two cards to be laminated on a laminating sheet sized to laminate a letter sized (8.5 inch x 11 inch) sheet of paper. Download the narrow version PDF for printing (66kb). This entry was posted in Boating Safety, Navigation, Sailing and Boating Skills and tagged Chart Reading, Correcting and Uncorrecting a Compass, Nav. Exercise, navigation symbols, TVMDC. Bookmark the permalink. Thank you very much. A very helpfull concise reference card. I hope to make good use of it.